In 2019 I have started work at Wageningen Food & Biobased Research at Wageningen University & Research to work on food data integration, conceptual modellering, and software development in public & private sector projects at the Food Informatics group. Before, as a Postdoctoral Researcher in the Knowledge Representation & Reasoning research group at Vrije Universiteit I worked on SlideWiki together with Ali Khalili, Darya Tarasowa, and many others in the SlideWiki H2020 EU project. I also did some work on SMS and LD-R with Ali Khalili and Peter van den Besselaar in the RISIS FP7 EU project. 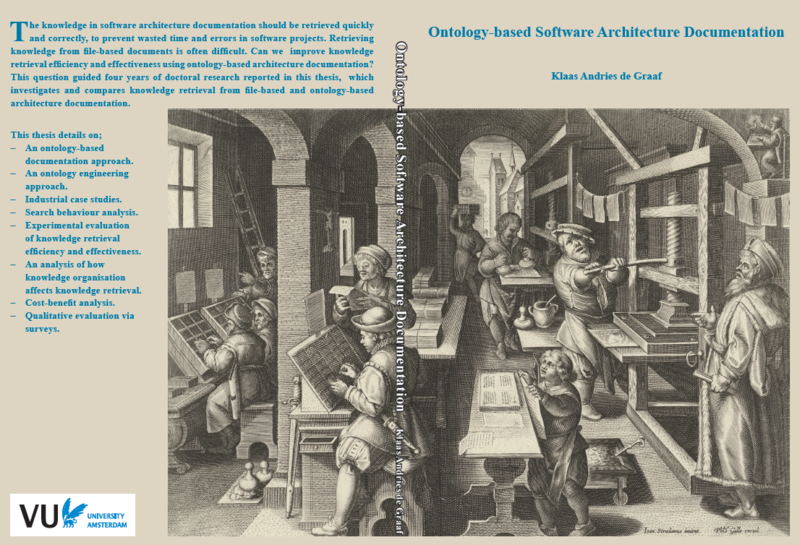 During my PhD in the IMSE research group I investigated the use of ontologies and semantic wikis to organise and retrieve knowledge in software architecture documentation. Software architecture, engineering, and documentation. Retrieval, modelling, management, and searching of architectural knowledge. Search heuristics, strategies, and cognitive biases. Computer graphics and knowledge visualisation. Do not hesitate to contact me ( ) about collaboration, projects, ideas, suggestions, literature, and references related to my research. Semantically Mapping Science (SMS) Platform [download ] - Ali Khalili, Peter van den Besselaar, Al Idrissou, Klaas Andries de Graaf, Frank van Harmelen - SemSci 2017: Enabling Open Semantic Science. CEUR Workshop Proceedings, p. 1-6 6 p., 2016. Towards an open infrastructure for Science, Technology and Innovation data [download - Peter van den Besselaar, Ali Khalili, Klaas Andries de Graaf, Al Idrissou, Antonis Loizou, Stefan Schlobach, Frank van Harmelen - 3rd OECD Blue Sky Conference, Sept 2016.